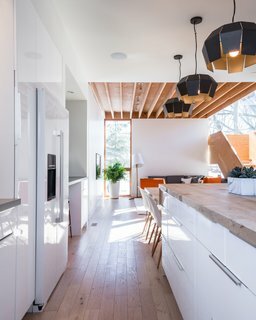 To accommodate his growing family, an intern architect in Canada builds a cost-efficient home that becomes the calling card of his future firm. 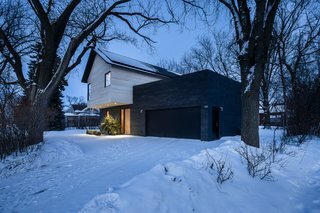 Constructed on a tight, tree-covered, infill lot in Steinbach, Manitoba, Canada, Elm Avenue Residence was designed and built by John Duerksen for his family of five with the help of a few friends. 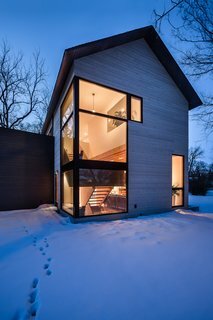 Then an intern for a firm in Winnipeg, Duerksen has since established his own eponymous architecture practice. The home's contemporary profile shows a sensitivity to the adjacent established homes, many of which sport Victorian-style roofs. 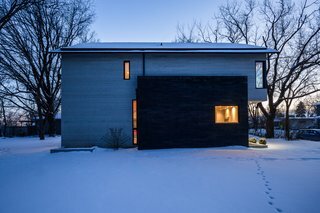 The residence exemplifies a strong sensitivity to site. Duerksen developed his design cues from the adjacent established homes, many of which sport Victorian-style roofs. He also placed priority on respecting the lots' existing trees while trying to retain as much sunlight as possible. 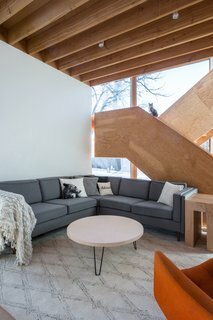 In an effort to keep costs down, the dark wood siding on the exterior and the feature interior staircase were constructed out of fir plywood by Duerksen himself. 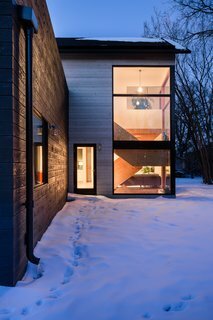 The home's cantilevered second floor gives the entrance the sense of a front porch. Given the lot's tight parameters and predominantly shaded landscape, a rooftop patio with a vegetable garden and a lounge space were strategically placed above the garage for maximum light. Large-scale picture windows also help maximize the home's access to natural sunlight. To help keep costs at bay, the dark exterior siding and feature staircase were constructed of fir plywood. 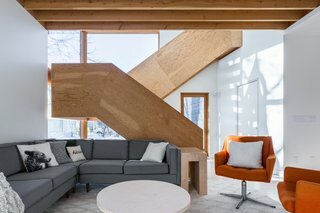 The stylish staircase provides a strong focus for the open-plan interior, and was constructed out of fir plywood by Duerksen himself. The staircase is constructed of laminated 3/4" plywood sheets, and all of the components are interlocking using mortise and tenon joints instead of fasteners. 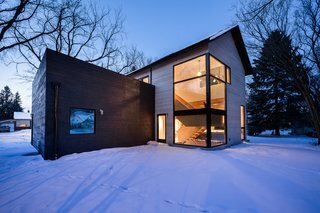 The footprint of the home was configured to accommodate all of the existing trees without risking damage to their roots. An exception was made for a tree which sat in the middle of the property which was showing signs of decay. 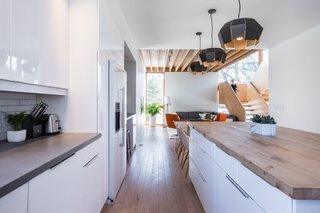 A dense Canadian Maple, the tree was milled and repurposed as the central island/dining room table—also built by Duerksen himself—and is now located only 10 feet from its original location. A finger-jointed drop provides soft definition between the island and dining area of the slab. The dimensions of the island/table were based on the amount of wood that was salvaged from the tree. 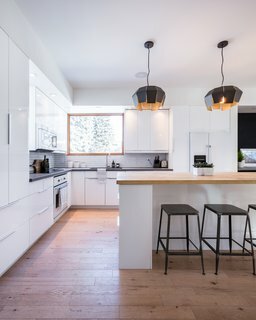 The open-plan, white kitchen helps keep the interiors bright and helps to create a greater sense of spaciousness. Midway through the build, Duerksen completed his internship and now runs his own architecture firm out of the home. Architect of Record: John Duerksen Architecture Inc. 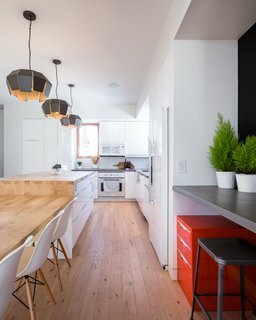 Builder / General Contractor: John Duerksen Architecture Inc. Structural Engineer: Wolfrom Engineering Ltd.
Civil Engineer: Genco Engineering Consultants Inc.